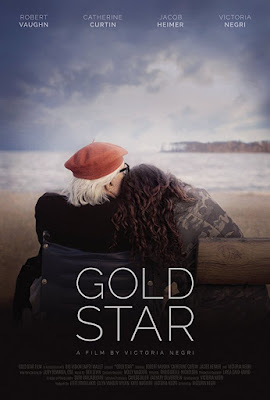 Victoria Negri's GOLD STAR is one of those films that makes you sit up and wonder why the hell more people aren't talking about it. Having played the festival circuit, where it won numerous awards, and containing a performance that in a perfect world would have an Oscar buzz for Robert Vaughn, the film is now quietly slipping into theaters and being missed by way too many people who should be out talking about the film to friends and family. It's a gem of a film that deserves to be on everyone's radar. Based on writer/director/producer and star Negri's own experiences the film charts the course of a young woman spinning her wheels in a seeming dead end life. There is nothing wrong with things as such but her boyfriend doesn't thrill her and her music career has been sidelined for shifts at a health club. Things get derailed further when her dad has a stroke and she is pressed into service as a caregiver. Perhaps with the Negri's achievements which are massive. She hits every mark perfectly and has made a film that will leave you tearing up as the credits roll. While I could wax poetic about all that Negri has pulled off let me just talk about the script which is top notch. Crafting a script that is filled with complex characters the film has real lived in quality. Having had to care for parents with health issues its clear that Negri really has been there and she doesn't dumb things down. I can't tell you how many films I've seen, often touted as coming from a person's real life experiences and the film ends up feeling sanitized. Best of all Negri has done something that few filmmakers ever do and that is make every character on screen well rounded and more than one note. No one is only one thing. Characters arc. Annoying ones become sympathetic, ones we like have off moments and people behave like people. While the cast is first rate across the board the real stand out here is the late Robert Vaughn who turns in an Oscar worthy performance. Silent, almost immobile, Vaughn makes it clear that there is a tiger behind his eyes. His looks in the final minutes of the film are crushing as in a few quick looks we see the love he has for his daughter, as well as the pain and uncertainty of his situation. I was sobbing. The film is, in its way a singular achievement of a filmmaker who has taken her vision and put it on the screen. This film is a quiet calling card of a filmmaker who should be a force to be reckoned with with the films that follow. Thinking about the film in writing this review I've come to realize that I think the reason the film isn't getting the notice it should is that on the face of it the film doesn't look any different than many similar films. Its only after the film starts and things begin to play out that you realize this is not the film you thought it was, it is something more human and more moving.It is a film you want to share and see again.